Tom (Darren Pettie), Beth (Heather Burns), Karen (Marin Hinkle) and Gabe (Jeremy Shamos) were a happy foursome until an unexpected breech. Photos by Jeremy Daniel. WE never really know what happens behind closed doors, do we? As Donald Margulies puts it in his 1999 Pulitzer Prize-winning "Dinner With Friends," "we can't even tell how things are going with the couple with whom we've shared meals, vacations and pregnancies." In 2001, the play was turned into an Emmy-nominated movie. 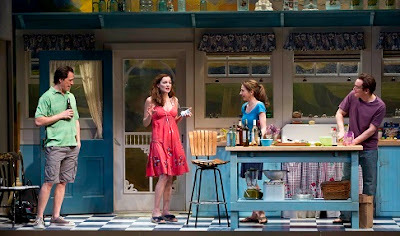 Now, it is enjoying a revival at Roundabout Theatre Company's Laura Pels Theatre through 16 April. "Dinner With Friends" tells a story we've all heard before: Man leaves wife for a younger, hotter woman; he lobbies their closest friends for approval, but it's too late; his wife has already easily won their sympathy. Despite their years of friendship, the couple's best friends shy away from the taint of the failed marriage. Tom (Darren Pettie) isn't at the regular dinner in Karen (Marin Hinkle) and Gabe's (Jeremy Shamos) well-organized kitchen. In his absence, explained away as a business trip, Gabe and Karen regale Beth (Heather Burns) with adventures from their recent gastro-trip. 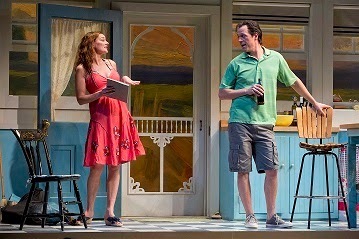 Allen Moyer's charmingly designed sets roll out seamlessly to reveal each mileu – from Beth's untidy bedroom to Karen and Gabe's house on Martha's Vineyard. (See opening night video below). Before dessert is served, Beth falls apart and tells Karen that Tom has left her for a stewardess. Meanwhile, snow prevents Tom from visiting his girlfriend, forcing him to return home. He soon realizes that Beth has "spilled." "You’ve got the advantage now!," he says. Incredulous, Beth exclaims, "What?! I do not!" "Of course, you do!," Tom retorts. "You got to them first!" Tom's only recourse, late as it is, is to drive over to tell Gabe and Karen his side of the story. He explains how unhappy he's been and how much in love he is. To Gabe, Tom's professed misery is a betrayal. Tom is not only walking out on Beth and his kids, he's also abandoning the friendship. Gabe, the domesticated, happily married man, is puzzled. "How can he walk away? I don’t understand it. How can he just...?" Karen echoes Gabe's sentiment, "He didn’t seem “miserable” at all," she says. "You mean to tell me we were sitting there having a wonderful time and he was not only miserable but in love with someone else?!" Beth (Heather Burns) and Tom (Darren Pettie) are having very common marital problems in "Dinner With Friends." DM approaches this all-too common tale as if it were all brand new. The ensemble in "Dinner With Friends," under Pam MacKinnon's well-paced direction, breathes fresh life and considerable subtlety into what could just be a cliche. Visit http://www.roundabouttheatre.org/Shows-Events/Dinner-With-Friends.aspx to learn more about "Dinner With Friends."